Of the many things that you are planning for your life’s most special day, the rings you will exchange, together with the memories, will outlast them all. You will wear your wedding band day-in and day-out for a lifetime as a symbol of the love and devotion you two have for each other. Unlike engagement rings that symbolise the promise to marry, wedding bands represent the lifelong commitment made on the wedding day. They are worn on the ring finger of the left hand, which is believed to have a vein that runs directly to the heart. 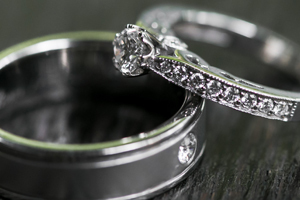 In addition to the emotional value and memories attached to the wedding ring, there is a symbolic aspect associated with the exchange of wedding bands as well. The circular, endless loop of the ring represents a bond of love that lasts for a lifetime, while the hole through the ring signifies a doorway leading to the future endeavours that the couple with experience and enjoy together. View our extensive collection of wedding bands in styles ranging from classic to contemporary and choose a wedding band that makes the perfect symbol of the love you share. Crafted by skilled artisans, designer wedding bands are a perfect choice for him who want to get creative with their expression of love. Featuring a complementing men’s wedding band, diamond sets are a perfect choice to celebrate life’s most joyous moment. 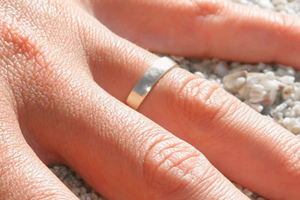 An emblem of love through time, plain wedding bands exude allure and elegance because of their simple, sleek design. 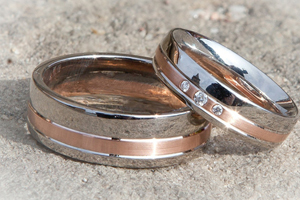 Traditionally, wedding bands are crafted with platinum or gold. While wedding bands can be embellished with any gemstone, diamonds remain the most popular choice because of their timeless elegance, brilliant shine, and unmatched durability. Enriched by a touch of originality and the timeless wedding ring tradition, our collection of wedding bands features creatively designed diamond wedding bands that are a symbol of everlasting love vows. From enduringly classic plain wedding bands to designer wedding bands that are crafted with great care and skill by our artisans, our collection has something for everyone’s taste and style.